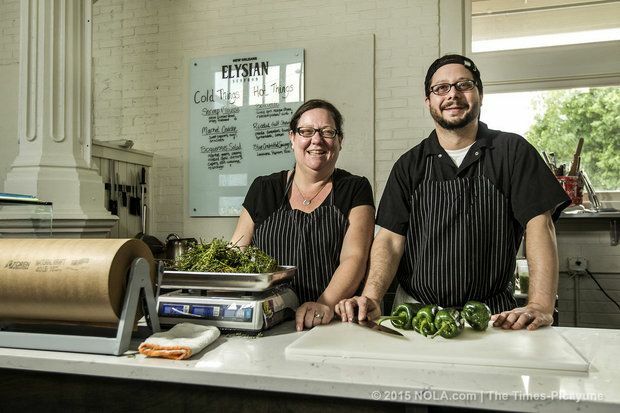 Jennifer Blackwell has become a real pop-up professional with her work on The Splendid Pig, and she's successfully expanded beloved oyster bar, Elysian Seafood, to multiple locations (both of these projects are co-operated with her husband). We recently asked her a few questions to learn more about her life in the culinary industry and her passion for working with food. MHS: What did you do before you owned a culinary business? JB: Prior to starting our own business, I was the GM/wine buyer of a restaurant for 16 years. I went to law school at Loyola University, but missed the restaurant life. Shortly after graduating, I was pulled back in for good. MHS: How you were inspired to make the transition and start your culinary business? JB: After working for someone else and executing their vision for so long, I felt ready to start something on my own. My husband and I began a pop-up on the side while we worked our full time jobs. This began the transition. It was a creative outlet to be able to create food that we were passionate about. JB: Making guests happy. I know that's what everyone says, but it's true! The best is watching someone’s facial expression when they get the first bite of something that really wows them. For instance, there's a unique and amazing look that some people get when they eat a perfect oyster. You can almost feel their toes curl, just by watching their face. I also get truly excited about our team and getting to see them working together in sync, loving what they do. MHS: What has been the hardest part of being in business? JB: Saying no. We love doing private events. It gives us an opportunity to do something different, tailored to each guest and their vision of what they would like their event to be. However, sometimes, we aren’t able to do everything we are asked to do. Making the decisions of what we can take on and what we have to turn down is difficult for me. JB: A great team – without them in place, we wouldn’t be able to keep moving forward and growing. A great community – when people support each other, we all benefit. My House Social has also been instrumental in helping grow our catering business. Y’all really foster that sense of community while also being a part of businesses that help each other grow. MHS: What's your favorite thing to cook for yourself? JB: I really enjoy cooking at home, as simple as that may sound. Lots of great local veggies are usually the basis for my dinner at home. MHS: What kind of food have you been thinking about experimenting with or adding to your menu? JB: Right now we are starting to have our Sous Chefs slowly take over menu development. It has been a great learning experience for us. Each of them has such a different background, learning about them through their food has been amazing. MHS: What's your ultimate goal with your business? JB: It changes as the business evolves. We are just opening two new locations right now, so expanding those is our current focus.